Microsoft is working on the project to give people more reason to buy things from the Microsoft Store, according to Windows Central sources. To date people buying video from Movies & TV have only been able to watch on Windows devices — a problem since while many people have Windows desktops and laptops, the platform is much less popular on phones and dedicated tablets. 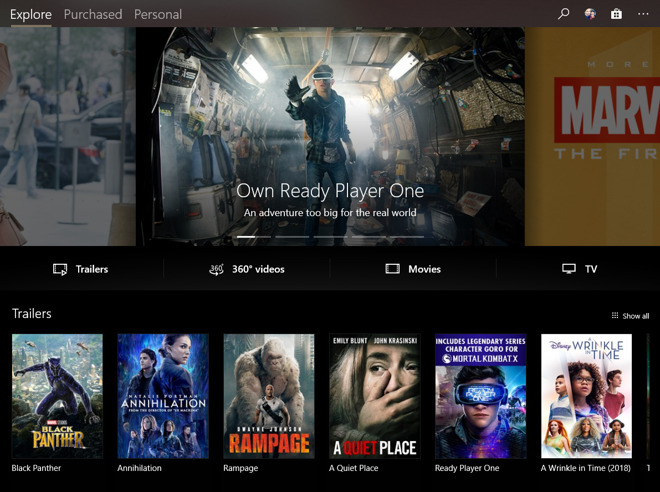 The company is also allegedly joining Movies Anywhere, a program meant to improve the value of online storefronts by ensuring video bought in one place can be accessed elsewhere. Currently partners include Amazon, Apple, Disney, Google, and Walmart's Vudu. A movie bought from Disney, for instance, can appear in both a person's iTunes and Google Play Movies libraries. Under current CEO Satya Nadella, Microsoft has become more open to supporting non-Windows platforms, content so long as people use the company's services. Office apps are accessible on iPhones and iPads, for example, but require an Office 365 subscription to access all features. The company is thought to be moving back into first-party mobile devices with "Andromeda," the codename for a pocketable Surface product. Assuming it's not scrapped before launch, the device could unfold to offer a tablet-sized screen.